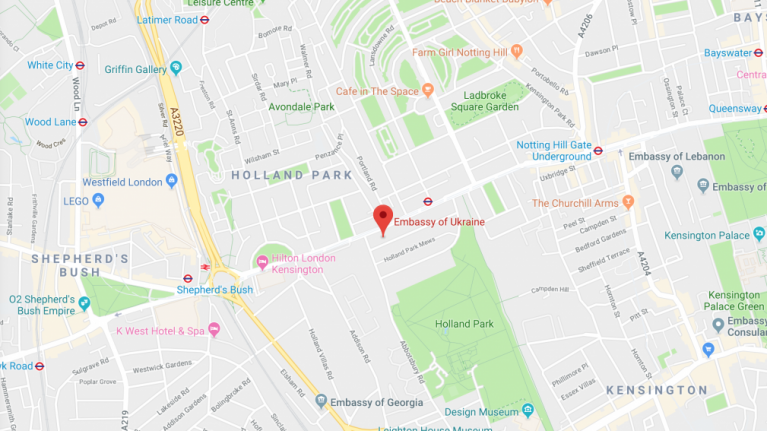 Police have opened fire on a vehicle outside the Ukrainian embassy to the UK, after it deliberately rammed the ambassador's vehicle while it sat outside the building. Police were called to the embassy in Holland Park, west London, at around 10am on Saturday. Authorities attempted to contain the vehicle, but it continued to ram the car. Officers then opened fire, The Metropolitan Police confirmed to Sky News. The man was then apprehended and is in police custody. The Met has also confirmed that it is not being treated as terror-related. A statement from the Ukrainian embassy said the official vehicle of its ambassador had been "deliberately" hit, and "police were forced to open fire on the perpetrator’s vehicle - the culprit was apprehended and taken to a police station". No staff were injured, and the ambassador, Natalia Galibarenko, was not at the embassy during the incident.